I hope you are having a good week in your corner of the world. It is still hot here, and Momma and I are both feeling a little low energy because of the heat. I am very grateful for fans and air conditioning! What did doggies do before air conditioning was invented?! This week I thought I would share a few dachshund postcards with you. As you probably know, I love to help Momma with her online shops. (She could not do this without me! I help with sourcing, listing, and sometimes packing, too.) A bit ago we found a box of unused postcards featuring dachshunds. They are larger postscards (Continental size, 4" x 6" - did you know postcards come in two sizes, Standard and Continental?). We are guessing they are 1970's to 1980's vintage. They are European cards, mostly from Germany, but some are from Denmark, Switzerland, France, and more. Every time I glimpse them in Momma's shop they make me happy. You can peek at them here: Dachshund postcards at Birdhouse Books. I thought I would share a few postcards with you, so you can smile too. I like green and purple together, so think this is an extra cute card -- that doxie is seeing something interesting, I believe! These pups look very comfy on their couch with that pillow. That wicker and gingham background makes me hopeful that the doxie pictured here is about to have a picnic lunch. Two little puppies are sitting in a bowl ... and they sure are cute! I am running out of questions to answer here, and would appreciate any questions sent in for future posts. They can be serious or fun ... any questions you would like to see answered here? I would love to hear from you in the comments, below. OH WOW! These postcards are adorable!!! This post made me smile! Those postcard photos are super cute! I understand about the heat - we've had a little less heat lately but it's still hot and hard to do much unless I get out early in the morning. Have a good weekend! I am sure all dog lover will like these awesome postcards. I have a friend who has a dachshund who would love to see these. I'll tell her about your postcards. Did you know that yesterday (or wednesday) was national hot dog day? best day ever for a cute little daschund! Super cute postcards! Too cute! This totally falls in line with Fluffy Friday. Have a great weekend! Such cute post cards! I have a Doxie/Chihuahua mix, so I'm definitely loving these. Also, how adorable that your pup blogs?! 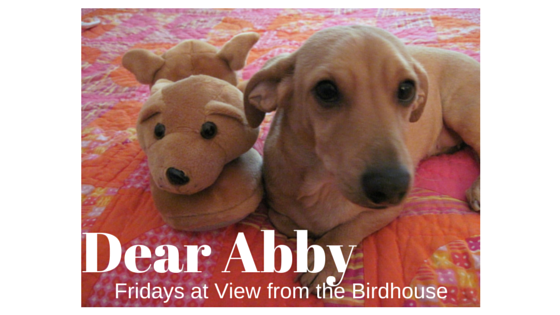 Abby, those post cards are all so adorable! We have a topic for you to write about: your experiences with social media. We have made so many wonderful connections and even some lovely friendships. There are some things that we don't enjoy about social media (like gossip, shaming, judgmental comments etc.) but if you are careful and choose your connections wisely, we find Twitter & Facebook to be a really good experience. Do you have any tips to help people & pups with this? Looking forward to your next column. And, by the way, we like purple & green together too! Love the post cards and hoping you can answer a question for me. In the middle of the night this loud noise woke me up. I think the loud noise is called thunder boomers, and that made me angry. Each time it boomed I bark to tell it to stop and then Dad yelled "No Ginger" at me as if the booming was my fault. Abby, how do you feel about thunder boomers and have you figured out a way to get it to stop booming? Thank you all for visiting my blog! I loved reading your comments. Barbara and Ginger Rose, I really appreciate your questions! They will be fun to answer in future posts here. Love and a happy week to all!